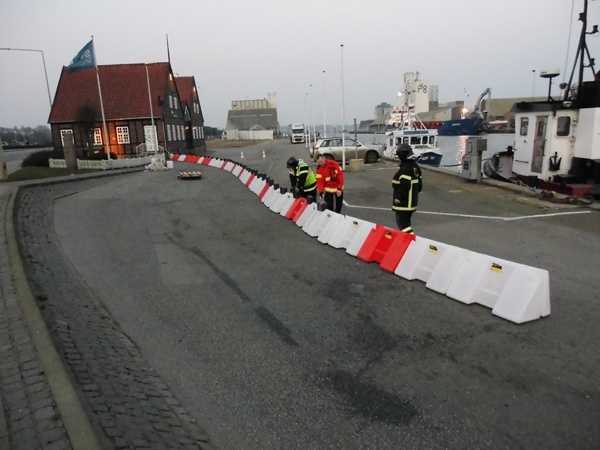 Our exclusive distributors in Denmark – DK Sea & Safety (http://www.dk-seasafety.com/) – oversaw a large demonstration of the Floodstop flood defence barrier in Denmark last week. The harbour is at threat of flooding via high spring tides every year and Floodstop has been procured to offer a rapid, practical and PROVEN solution to this problem. 180 metres of the 0.5m high Floodstop can be deployed in 90 minutes. Once deployed the system can be left in place for as long as required. The system is not susceptible to heavy winds and vandals. Floodstop is a unique (patented) flood barrier that uses the rising floodwater to create flood protection. Unrestrained by the need to connect to permanent ground fittings, it is a portable flood defence system that offers a variety of uses for Councils, Emergency Services, Public Works, Civil Contractors and homeowners.